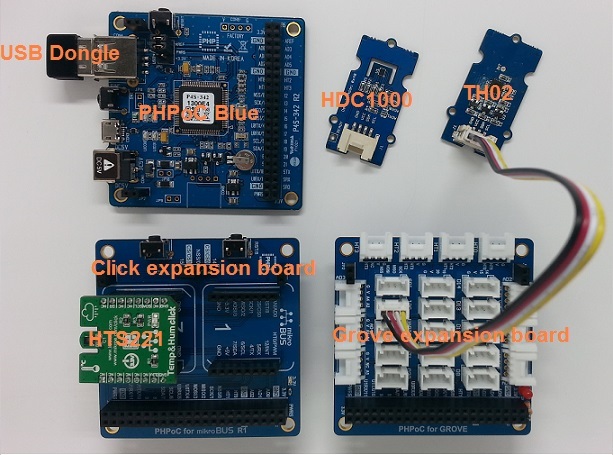 This project shows how to read temperature & humidity from TH02, HDC1000 or HTS221 and send ThingSpeak using ThingSpeak library for PHPoC. This project shows how PHPoC reads data from temperature and humidity sensor and then send these values to ThingSpeak. ThingSpeak is the open platform for Internet of Thing. You can store your data on Thingspeak storage; analyze, visualize data, etc. For more detail, visit https://thingspeak.com/. My channel with two fields: temperature and humidity. Create a ThingSpeak account (visit https://thingspeak.com/users/sign_up). Create a channel with two fields: Temperature and Humidity, (visit https://thingspeak.com/channels). Write down your channel id, write API Key, read API Key in source code. *@param: $post_msg: Raw URL to write to ThingSpeak as a String. See the documentation at https://thingspeak.com/docs/channels#update_feed. *@remark: This is low level functionality that will not be required by most users. *@param: $field: Field number (1-8) within the channel to write to. *@param: $value: Value to write (any type). ThingSpeak limits this field to 255 bytes. *@remark: Visit https://thingspeak.com/docs/channels for more information about channels, API keys, and fields. ThingSpeak limits the number of writes to a channel to once every 15 seconds. *@param: $value: value to write (any type). ThingSpeak limits this to 255 bytes. *@brief: Set the status of a multi-field update. To record a status message on a write, call thingspeak_set_status() then call thingspeak_write_fields(). Use status to provide additonal details when writing a channel update. *@param: $status: String to write (UTF8). ThingSpeak limits this to 255 bytes. *@param: $twitter: Twitter account name as a String. *@param: $tweet: Twitter message as a String (UTF-8) limited to 140 character. *@remark: Prior to using this feature, a twitter account must be linked to your ThingSpeak account. Do this by logging into ThingSpeak and going to Apps, then ThingTweet and clicking Link Twitter Account. *@param: $created_at Desired timestamp to be included with the channel update as a String. The timestamp string must be in the ISO 8601 format. Example "2017-03-23T13:59:59"
*@remark: Timezones can be set using the timezone hour offset parameter. For example, a timestamp for Eastern Standard Time is: "2017-01-12 13:22:54-05". If no timezone hour offset parameter is used, UTC time is assumed. *@param: $field: Field number (1-8) within the channel to read from. *@return: Value read (UTF8 string). An empty string is returned if there was no status written to the channel or in case of an error. Use getLastthingspeak_read_status() to get more specific information. *@return: Value read (UTF8 string). An empty string is returned if there was no created-at timestamp written to the channel or in case of an error. Use getLastthingspeak_read_status() to get more specific information. define("AVERAGE_REG",        0x10); // To configure humidity/temperature average. // Calculate Temperature in decimal of grade centigrades i.e. 15.0 = 150. // Calculate humidity in decimal of grade centigrades i.e. 15.0 = 150.